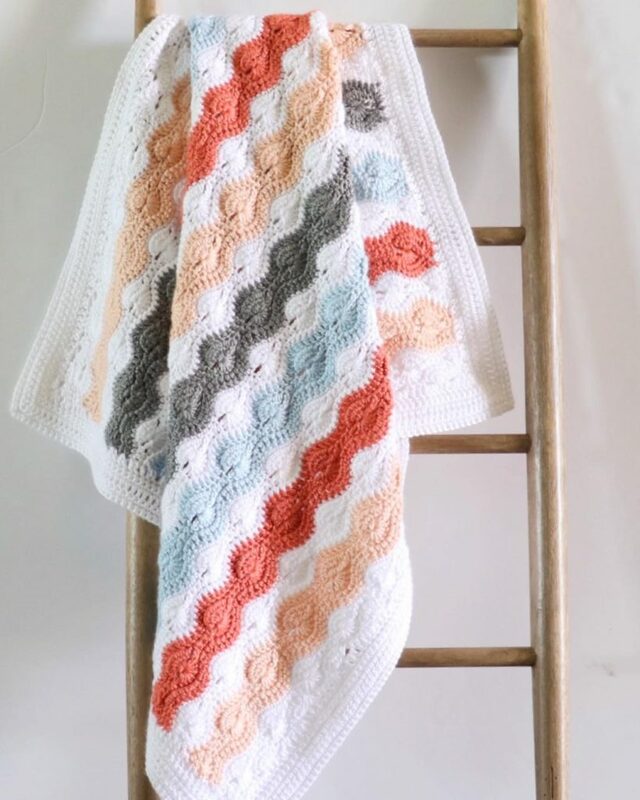 I love a classic crochet pattern! I found the Catherine’s Wheel Stitch in several of my stitch books and was determined to make a blanket with it someday and that day is finally here! I feel like Catherine’s Wheel is a cousin stitch to the Harlequin Stitch I’ve done in the past. The Catherine’s Wheel is a bit easier with fewer steps to learn. 1 ball each of Caron Simply Soft in Persimmon, Soft Blue, Light Country Peach, and Gray Heather. Pattern repeat is 10 + 6 + 1. That means you can make a chain any multiple of 10, then add 6, then add one for the turning chain. ROW 1: Work 1 SC in the 2nd CH from the hook. Work 1 SC into the next CH. *Skip over 3 chains, work 7 DC in the next chain. SKip 3 CH, 1 SC into each of the next 3 chains. Repeat from the * to the last 4 chains. Skip over 3 of them and work 4 DC into the very last chain on the row. Turn. ROW 2: CH 1, 1 SC into each of the first two DC. *CH 3, work 7 double crochet together across the next 7 stitches. CH 3, 1 SC in each of the next 3 stitches, Repeat from * to last 4 stitches. CH 3, DC4tog across last 4 sts. Turn. ROW 3: CH 3, 3 DC in first stitch, (turning chain counts a DC) *SKip 3 CH, 1 SC in each of the next 3 SC. SK 3 CH, 7 DC in the loop that closed the 7dctog, Repeat from * and end by skipping 3 CH, work 1 SC in each of the last 2 SC. Turn. ROW 4: Ch 1. SC into the top of each stitch across the row. Pull through with new color on the last step of the SC stitch. Turn. ROW 5: Ch 3. DC into the top of each stitch across the row. ROW 6: CH 3, DC3tog across the next 3 stitches, *CH 3, 1 SC in each of the next 3 stitches, CH 3, 7DCtog across the next 7 stitches, repeat from * to the ending 2 stitches. CH 3, 1 SC in last stitch, 1 SC in the top of the turning chain. Turn. ROW 7: CH 1, 1 SC in each of the next 2 SC. *SKip 3 chains, 7 DC in closed loop of the 7dctog. Skip 3 chains, 1 SC in each of the next 3 SC. Repeat from * to the end, skip over the last 3 chains and work 4DC into the top of the turning chain from the row below. Turn. ROW 8: CH 3. DC into each of the next stitches across the row, the chain 3 counts as the first stitch. Pull through with White on the last stitch. Cut Peach (leave a long tail to weave in later.) Turn. ROW 9: CH 1. 1 SC into the top of each DC from the row below, the last SC will be into the top of the ch 3 from the row below. ROWS 10-12: Repeat ROWS 2-4. ROWS 13-16: Repeat ROWS 5-8. Continue Repeating the instructions for rows 10-16 working the color changes in this order: Light Country Peach, Heathered Grey, Soft Blue, Persimmon. End with one extra row of Light Country Peach. Border: (Before beginning the border, weave in all the ends.) In any corner, pull up a loop and CH 3. DC into each space as evenly as possible, work 3 DC into each corner space. Generally, work 2 DC per row on the sides where rows end with CH 3’s or DC, and work 1 DC per row when they end with SC. And on the top and bottom of the blanket, generally work 3 DC around the ch 3’s, one into the eye of the circle, and one into the tops of the SC’s. Join the round with a slip stitch into the starting CH 3 and turn. Work 2 rounds of SC, working 3 into each corner, and one each into the tops of the DC’s. Join the rounds with SL ST and turn. CH 3 and work 1 round of DC, working 3 into each corner and one into the tops of each SC. Join with a SL ST and turn. CH 1 and work 2 more rounds of SC as before. Join at the end of the second round, tie off and weave in the ends. For the best finishing results, I like to hand wash the blanket, roll in a towel to get a lot of the water out, then lay it on foam blocking mats, pin it into a square shape and let dry. If you feel your blanket doesn’t need a hand wash, lay blanket out on the mats and use a spray bottle with water to spritz the blanket until it is damp. Then pin it into a square and let dry. If you need video help for the Catherine’s Wheel Stitch and would like to practice a swatch before you tackle this blanket, watch the video below, or view it on YouTube.